The AGM of Maidenhead Heritage Trust was held on 28 September. Trustee Harry Wale deputised for Chairman Richard Poad and reported a year of substantial progress. On the all-important financial front, income and expenditure, and the balance sheet were all in good shape. Curator Nick Forder’s report showed good progress towards having our Accreditation status renewed by Arts Council England and told us that the Heritage Centre includes over 6000 accessioned objects on our database. The Education Officer Jon Dance-Groom reported increases in our schools, families and youth groups programmes, with 35 school sessions delivered in 2015/16. The ATA Gallery meanwhile has seen growth in visitors and income, and competitive Spitfire simulator events are being introduced for corporate and private groups. Looking ahead, the York Road development scheme gives us the prospect of a substantial increase in floor space, in a newly constructed building. Initial thoughts on the vision for our new Centre call for an expansion of our current Maidenhead Timeline exhibition, plus a themed Transport and Maidenhead displays. These could cover the River Thames and the town’s origin as Maiden Hythe; rail with the links to the bridge, Brunel and the GWR; road with the stage coach station, the Vanwall racing car and other cars made in Maidenhead; plus, of course flight, with our Air Transport Auxiliary and White Waltham links and the Spitfire simulator. Plans are underway to develop this vision both in written and concept design form to further our discussions on the York Road scheme with the Borough and its 5 short-listed development partners. Christopher Hobbs was elected as a new Trustee. Christopher has a background in marketing and is a keen car enthusiast. He owns several classic cars and was one of the people who curated our popular exhibition about Maidenhead’s Motor Industry in 2014. 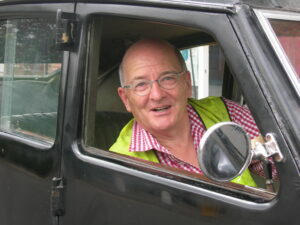 The photo shows him at the wheel of the 1930s car the Crossley Burney, based on the Maidenhead built Burney Streamline.